Let’s get down to the important business ………. So the Champions’ League 2012-13 is upon us. Here’s a bit of info and ill-informed thought on our oppo this time around. 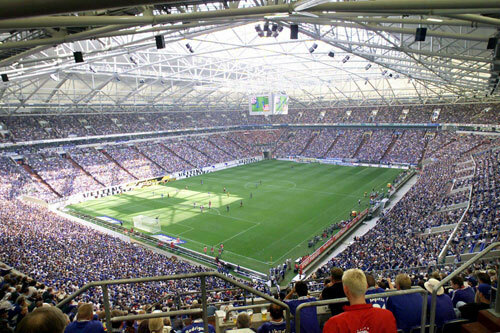 Stadium: Veltins Arena in Gelsenkirchen (61,000 capacity). Has a retractable roof. 2011-12 performance: 3rd, but 17 points behind champions Dortmund. Lost 10 games and conceded 44 goals. The players: Their most significant players are probably Klaas-Jan Huntelaar (“the best box player in the world at the moment” said his manager in April), Jefferson Farfan (good quality right winger) and Christoph Metzelder (experienced though slow defender). The loss of Raúl to Qatari football will be a big loss – he had two excellent years at Schalke, and worked very well with Huntelaar. 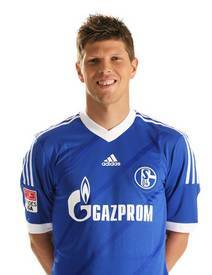 But the dangerman remains Huntelaar, as confirmed by 48 goals scored in 47 games last season. Control him and we’ll be a long way to dealing with Schalke. The fans: Club has 100,000 members. Recently departed Raúl said “In each game, how they [the Schalke fans] live for the club, it’s almost like a religion if you want to put it that way. This is really wonderful.” And having gone there in 2001 when we lost 3-1, I can confirm it is a great place to watch football, there is a real passion for football and for their club. Stadium: Karaiskakis Stadium in Piraeus (32,000 capacity). 2011-12 performance: Olympiacos are the reigning champions and are Greece’s most successful club; they have won 14 of the last 16 league titles. (Being a fan of their bitter rivals, Panathinaikos, must be even more annoying than being a Spurs fan.) Last season, they conceded only 17 goals, so they may be pretty effective at the back. The players: This is a team of veterans. There will be at least one familiar face, in the form of Roy Carroll. The loss of the Greek Super League’s leading scorer, Kevin Mirallas, to Everton will hit Olympiacos hard. But they will look to Rafik Djebbor and experienced Marko Pantelic to make up the difference. Ariel Ibagaza, David Fuster, and Djamel Abdoun will be the principal creative forces. The fans: They will be intense, as we know all fans from south-eastern Europe are. Their rivalry with Panathinaikos is called the “derby of the eternal enemies”. The derby in February was abandoned due to rioting, which included throwing firebombs and resulted in multiple injuries being suffered by police officers. 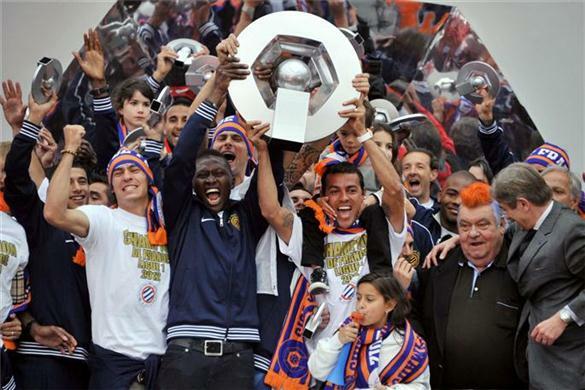 2011-12 performance: For the first time, Montpellier were crowned French champions. Given that they started the season simply wanting to avoid relegation and they were competing with PSG’s money and the experience of Lyon, Bordeaux, Marseille and Lille, that is deeply impressive. They had only finished in the top three once before, more than 20 years ago. They’ve had some great players in the past, like Laurent Blanc, Eric Cantona and Carlos Valderrama, but winning the French title was a genuine shock. Their win was based on excellent home form (they won 16 out of 19 home games). Here’s what Girard said on seeing his players become champions: “It just goes to show that everyone can beat everyone and that money isn’t the be-all and end-all. We’re a club of mates, a club that brings young players through and gives them a chance. At the end of the day, it’s worked out well for us. We played some great football, with a well-balanced team and I’m overwhelmed.” Donchya love it?! The players: The squad is based on youth, nurtured in-house and recruited from elsewhere – sound familiar? Losing Olivier Giroud to us will hurt, he was joint top scorer in Ligue 1 last year. But they have a bright young creative talent in the form of Younès Belhanda, and will be looking to him to weigh in with goals and assists. His manager has likened Belhanda to Robert Pirès. High praise indeed. They also have former Pompey striker, John Utaka. In defence, Henri Bedimo and (if we, Milan or someone else haven’t signed him) Mapou Yanga-Mbiwa will provide a tough shield to get past. The fans: After last season, they’ll be euphoric. Beyond that, I can’t say much, but coming from a university town in a pretty part of France, I’m sure they’ll be charming. So overall, we’d have to say the draw has been pretty kind to us this year. It won’t be completely straightforward (Olympiacos did beat us last year, for example). But this is a group we should feel we can cope with, and enjoy. Arsenal – Hardball or Soft Sell? Today’s post derives from a comment posted by Adrian yesterday. It is fair to say that his opinions are not in keeping with many on this site but they do represent an interesting counterargument that is worthy of debate. RVP, Song and now maybe Walcott – although the latest reports suggest he may stay. Fabregas, Nasri and Clichy last year. Anyone want to guess whose turn it is to shine this season only to be sold by our great owners at a minimum of 200% or higher profit to the highest bidder the next transfer window? I’m sorry, but those who are insisting that we are good enough to compete for silverware need a reality check. Don’t get me wrong, the 3 players we brought in are very promising prospects, but so far only Cazorla has truly shone. Even then, you need to remember that Cazorla is no Fabregas and Podolski/Giroud is no RvP. The point is, the club has been continually selling its BEST players and replacing them with decent players but in some cases not as good as their predecessors. Just take a look at Chelsea/Man city’s squad, it is very unlikely that we will have the squad depth or quality that can match theirs even though we have a fairly decent squad. Diaby is too injury prone, Arteta and Rosicky are getting one year older, Wilshere will be back god knows when, Ramsey is very inconsistent although promising. Therefore while it may appear on paper that we have a decent squad with enough depth, at a closer look you’ll start to notice some cracks and problems. The last thing we need now is for Theo to leave. I simply cannot understand why some people have mentioned that the business end of the club is being well run. For heavens sake, its 2012 now and wage inflation has already been going on for some time. As of now, it is the norm for the better players to get around 100k a week. For those insisting that players getting 100k a week to play football is unreasonable and absurd, you need to ask yourself this, does 70k and a 100k really makes a big difference? Clubs everywhere are already paying these type of wages to their players for many years and it is time for Arsenal to go along with this concept and start being competitive salary wise, considering that Arsenal season tickets are the HIGHEST in the EPL. For heaven’s sake, we are Arsenal, one of the top clubs in England, not a 1st division side. As mentioned above, a quality winger would easily cost 10m+, so why the big fuss over the 6m increase in Theo’s salary? Taking a stand against player contracts is very admirable, but once again you have to question the way the board acts in a business sense. Why only take a stand in the LAST THREE days of the transfer window? If they were not prepared to accede to a demand of above 75k (which is absurd as losing 3 vital first team players in a transfer window for 2 seasons consecutively should not happen in any top club), why didn’t they make it clear weeks or even months ago? Why only take a stubborn stand when there are only 3 days left to the transfer window thus leaving us with even less time to find a replacement? For those saying that the Ox will be a great replacement in the unfortunate event that Theo leaves, he is good but not polished or fully established yet and depth as mentioned before is vital when we are challenging in 4 competitions. And Gnabry, seriously? You expect a reserves squad member to step up and instantly hit the ground running in the EPL? As for those who mentioned Affelay, he will only be available ON LOAN. Some of you slagged Theo saying that he doesn’t want to play in an Arsenal shirt. What makes you think Affelay who is only on loan from Barca will play for us with all his heart IF he does come, as the club in his heart is Barca? I must say I am very disappointed with the way the club has operated in the transfer window this season. I thought what happened last season would not be repeated this transfer window, but clearly I was wrong. For now I can only hope that this will not happen again next year. I strongly believe that Theo should be kept and is a vital part of the squad. Too many changes will do us no good. After watching our first two matches, I have some thoughts and observations I’d like to share. This may be (hopefully) a busy week, so as you read this some personnel may have changed. I have been keeping up with the blogs, and there is an unusual amount of agreement among fans about the defense, and the team in general. 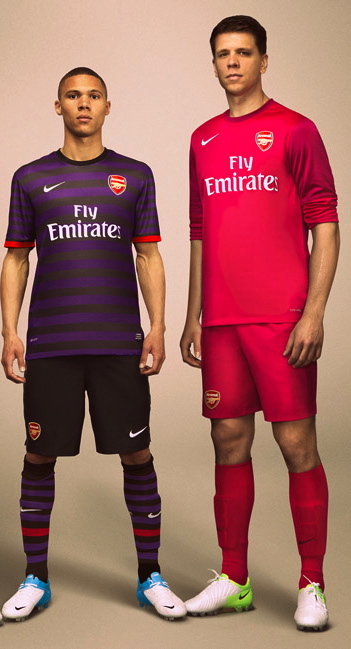 It seems Steve Bould’s influence is apparent. The discipline and cohesiveness are plain to see. Tommy Vermaelen only bombed forward a bit – late in the match vs Sunderland, when we were chasing a win at home against the bus, and in those circumstances, I was happy to see it. Much better than being in the opponents box when we are nursing a lead, like last season. Mertesacker has been his normal, under-rated, steady self. But effective as usual. Hopefully we will have our best defender Kozscielny back soon. I have said before, I would stack up our first 3 CB’s against any team’s. A lot of us have noticed how well Gibbs has played – for me it’s obvious why he has defended so well. It’s FOCUS. I don’t mean that in an abstract, cliche way – I mean.. he has been told to be a defender first. He needed this, because in the past he didn’t excel in any facet, now he has shown he can be a very good defender at least, which is more than before. The same for Jenkinson, he has so far avoided being caught out of position as he was in the pre-season friendlies, which had us all worried. So our boy Sagna, with Jenks, Coquelin and Yennaris, might leave us well covered at RB. But these defensive improvements come at a cost. As you know, a big part of our attack has always included our full backs participating, and I do feel like I’ve noticed that has been curtailed so far in the two matches. I’m not saying that it’s the problem, but we all knew in the back of our minds, that the discipline we were asking for would make for a slightly less exciting attack. I do believe, that when our coaches see enough defensive discipline, the fullbacks will be encouraged to help a little more -but hopefully in a responsible way. In the comments section after the Stoke match, our friend LB made a great point, which I had been pondering during the match, and that is – if our defense is looking so tight, maybe we don’t need a killer defensive midfielder. But I will disagree, because, even though I considered it, I remembered how I felt watching some of our future opponents offensive squads in the past two weeks. Chelsea with Torrez, Hazard, Mata, Oscar, Marin, Sturridge ( and probably another top striker to come). City with Aguero, Tevez, Dzeko, Balotelli, Silva, and Nasri. United is the weakest of the top teams with Rooney,VP, Chicharrito, Berbatov (?) Kagawa, but the worst midfield behind them. 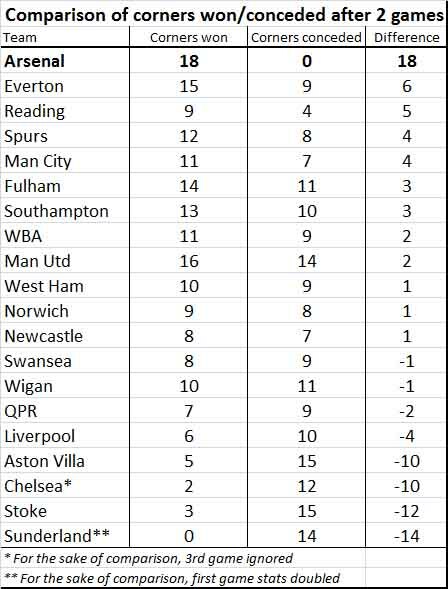 And the next tier of teams including an improved Everton, Newcastle, and Spurs are all more dangerous than the teams we just held scoreless. At Liverpool, Suarez alone has more talent than anyone we have faced so far. By the way, looking at that list, I really think we need one more striker, I like our crew, but if we really want to challenge in all competitions, Giroud and Podolski will be way overworked. But we will have the best midfield in the league, talented and deep, for sure. I am amazed at the divergence of opinion about Diaby, everyone watching the same performances can have such disagreement. I see it this way: I’ve watched some older matches over this summer from 2009,10.. and obviously so far this season. I think he is talented, but in a subtle way, he is not as slow as he appears, very fluid, with a nice shot in him, uses his upper body very well to keep players at bay, but I don’t see him as a DM. Arteta does everything and anything asked of him, and very well, including excellent tackling, but I think we are a little better if he is free to go forward more, especially since we didn’t add Sahin, and we don’t want to rush or pressure Wilshere. By the way, even though I defended Song alot last season, he was a clown, and WE are better without him. He can be coached into playing well as CB/DM for Barca, I will admit. Thy do know how to recognize physical talent. So, I think, particularly in those big matches, I would feel more secure having an aggressively defensive midfielder, who is also a very good passer, if only to protect our new organized, effective back four, which I think we will all be proud of this season. MJC has submitted the chart below that compares the corners won against those conceded after the first two games, this data adds weight to some of the points made in JNYC’s post today………..
Time To Get Tough With The “Already On The Way Down” Brigade? I watched a lot of football over the weekend: Manchester United versus Fulham, in which some Dutch bloke scuffed the ball over the line; Chelsea v Newcastle, a mid table clash between the fifth and sixth best teams in England; Stoke v Arsenal, in which a party of brave adventurers including at least one dwarf travelled to Mordor, failed to slay some Orcs and came home again; and, finally, a mugging in Liverpool (I know that’s not news, but this one was a footballing mugging, with the away team stealing an undeserved point). There were many talking points from those games (including Wayne Rooney experiencing a nasty old gash; the usual bovine booing of Aaron Ramsey by the Stoke herd and Martin Skrtel demonstrating why you can never afford to be sloppy with an exposed rear). But the incident that really caught my eye was Chelsea’s first goal in their 2-0 victory over Newcastle United. It was scored by Eden Hazard from the penalty spot after Torres was deemed to have been tripped in the box by Newcastle’s sweetly named midfielder Anita. The problem is that to me, at least, it was not a penalty. Torres jinked into the box and pushed the ball past Anita who looked as if she (sorry, he) was going to stick out a leg. Anticipating the contact, Torres instantly tipped into the two-footed “Sniper*” fall and went down. The only trouble was that Rita, after starting to dangle out a foot, quickly pulled it back again. There may have been slight contact, but only because Torres’ legs were spread out to the sides in the first stages of the “Sniper”. Certainly the contact would not have been sufficient to upend the Spaniard if he had carried on running instead of playing for the penalty. The referee was Phil Dowd and all Arsenal fans will remember from a certain 4-4 draw at St James’s Park that he is perfectly capable of awarding a penalty for nothing. But I am not going to lay the blame on Fat Phil for this one. The fact is that many in the game today would argue strongly that the incident was a foul and deserved a penalty. They would point to the fact that there was some contact, however little, and that Juanita stuck her leg out, even though she quickly withdrew it. In my book it’s a form of cheating and bad sportsmanship, although some pundits would describe Torres’ behavior as “clever” for having won the penalty; and certain players would no doubt say that they go down in anticipation of the challenge to avoid injury (I wonder what their domestic lives are like: Wife: “What ARE you doing?” Player: “Er… going down in case of injury?” Wife: “That’s funny, that’s exactly what John Terry said yesterday… Oops”). Newcastle manager Punchy Pardew was being restrained when he said afterwards that Torres “made a meal” of it. As it happens, in this game I don’t think it made any difference. Chelsea, I’m afraid to say, were on top for the whole game and would certainly have won it with or without the penalty. Their new creative signings have made them a force to be reckoned with. We can only hope that, as the older “stars” like Lampard and Terry start to get edged out, the usual discord will follow and will act like dry rot in the London Oilers’ edifice. Some of the shocking dives last season by the likes of Ashley Young and Gareth Bale were defended on the grounds that they were “anticipating” the fall. Simple sportsmanship dictates that you don’t go down without being forced to. The Titanic did not “anticipate” the iceberg and plunge head first into the icy Atlantic seas before making any contact with the ‘berg. Effects need causes otherwise they become causes in themselves. The only solution to this cheating is – as with so many problem areas in modern football – the use of retrospective video evidence to punish offenders. At the moment this can’t happen because of the ludicrous rule that if the referee witnessed the incident his decision cannot be second guessed. Because referees, like the Pope, are infallible. I would suggest a panel of ex players and referees should sit in judgement of such incidents. Their decision would not affect the result of the game, but they could award a ban to anyone found to be cheating. If they are not unanimous, the benefit of the doubt would go to the striker. Of course to an Arsenal supporter this is mostly academic (no penalties awarded to us at home during all of last season, remember). But even if referees are allergic to awarding spot kicks for us, we know they’ll be happy enough to dish them out to our opponents. Clamping down on the “already on his way down-ers” would benefit not just us, but the game as a whole. *The Sniper is so called because it looks as if the player has been shot in the back from behind, sending his upper body forward while his legs fly out to the sides. The Sniper is believed to have been the subject of a Trademark dispute between Wayne Rooney and Steven Gerrard, both of whom claim they invented it. The dive is now sold under licence in several countries including Spain, where Dani Alves holds the rights. Nil – Nil to the Arsenal, Nil – Nil to the Arsenal…. Match Report. Having just returned from a holiday in the South of France; a country with a wonderful climate and a farming industry that provides its people with more or less everything that one could wish for – French supermarkets are the closest earthlings can get to heaven, if you are, like me, one of those who lives to eat rather than eats to live – I cannot help but wonder what the likes of Giroud (French, born in Chambery, situated in the wonderful French Alps), and Cazorla (Spanish, born in Llanera, North-West Spain) made of their trip to the Country of Wrath – The Land of the Orcs. Just imagine our new signings pronouncing the word(s): ‘Stoke (on Trent)’: I reckon it would sound like somebody choking on a lump of baguette. Compare that to the poetic sounds of ‘Chambery’ and ‘Montpellier’, or ‘Llanera’ and ‘Malaga’, and I think you know where I am coming from. Going to the North-West/East has seldom or never been easy for Arsenal, and Sunday’s trip to Stoke was the first big physical and mental test for both Arsenal as a ‘new’ team and for our new arrivals in particular. Luckily, in quick succession, the Northern ‘B-teams’ – Blackburn, Bolton, Blackpool, Burnley – have dropped out of the Premier League in the last few years, resulting in fewer visits to that doomed corner of the country this season. And long may it continue. Whatever Santi and Oliver made of the place, and its physically/intellectually/emotionally challenged people (booing Aaron Ramsey sums it all up), they showed no signs of weakness or need to adjust to their new surroundings. That, combined with another fine performance by our defence, are the main positives we can take away from Sunday’s game. From the start, it became clear Stoke expected us to dominate play and a row of 4 defenders and five midfielders were positioned in front of their goalie, in order to make life difficult for us. Arsenal combined well and was able to pin Stoke back from the first minute. The ball was being passed round the way we have become so used to over the last few years, and we were able to breach their bus-shaped defensive walls on a number of occasions. If, now and again, we lost the ball in Stoke’s half – especially Diaby and Gervinho had a few moments of weakness at the start of the game – our defenders pressed the opposition quickly and forcefully, resulting in us regaining possession almost instantly. On Sunday, we owned the area between their box and the mid-circle once again, and long may it continue. We were bullying the Orcs and it felt fecking brilliant! There were a number of opportunities in the first half. As early as the eight’s minute, Giroud combined with Podolksi in the box and the latter had a decent opportunity to score. The Stoke defender Wilkinson lost his balance as a result of Giroud’s and the Pod’s quick movement, and whilst falling over, the former, serendipitously, ended up in the path of Pod’s attempt on goal. He handled the ball but I don’t think it was a penalty, and we are not Chelsea of course; so nothing given. The excellent Prince Poldi, who often could be found away from his left wing position, made a mazy run through the middle and was cynically fouled by Huth. 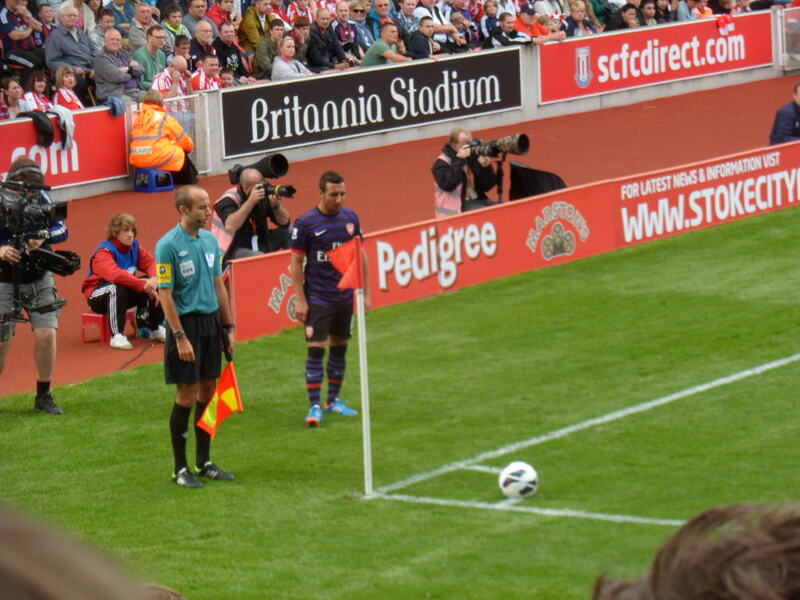 The subsequent free-kick, from a promising position, just outside the box, was wasted by Cazorla. Unfortunately, it would not be the last free-kick to be wasted by Arsenal during the game. Another good move led to a cross from the left which Giroud just could not reach with his head. On top of that, Cazorla had a number of shots at goal from distance, and all in all we deserved a goal from our efforts. However, it is fair to say, that although we created a number of chances in the first half, we still looked quite rusty in our attacking efforts. This should not come as a big surprise to us, as except for Gervinho, all our attack-minded players are new. On top of that, Diaby has not played regular football for a long, long time and Arteta has only just returned from a long-term injury as well. They will need time to gel so they can become more instinctive and effective, and the only way to do this is by training hard, and especially by playing more and more competitive games together. 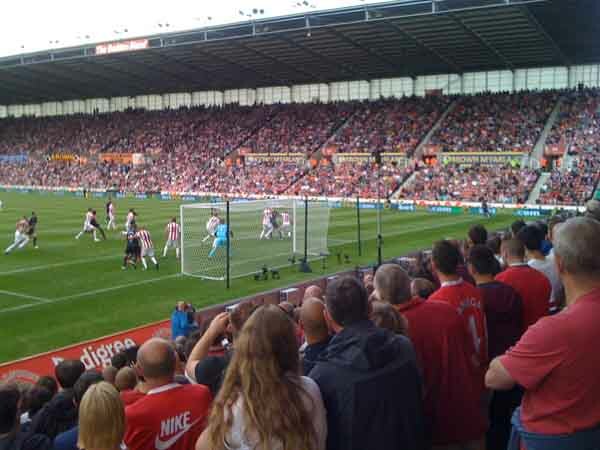 Stoke were only able to get a few set-pieces against us and our defence, including our stand-in goalie Mannone, remained calm and organised – never allowing the crowd any satisfaction. Once again, we were the ones who controlled the game. I can be short about the second half. It was disappointing to see we could not move a gear up with regards to our attacking efforts after the break. I have seldom seen Arsenal so risk averse. The FB’s did not offer as much support to our wingers as we’ve got used to over the years, and the CB’s stayed continuously behind. I felt Cazorla got more and more isolated and tired as both Diaby and, the once again excellent, Arteta sat back more and more. Diaby and Arteta helped out our defence when it really mattered though in the second half, which was great to see, as well as crucial. The substitutions of our ‘wingers’ Gervinho and Podolski, by Theo and The Ox, made sense, but they also could not make a significant difference. There were still a few half-chances for Giroud, but a combination of tiredness and over-eagerness, meant he was not able to turn them into goals – although he almost clinched the three points for us with a beautifully imagined, and subsequently executed diagonal lob over the goalie from 25 yards or so. But, it was not to be. I watched the game in a busy and loud pub, which made it difficult to analyse the game with a bit more depth. I would love to watch the game again with just one objective: to check out how much support both Arteta and Diaby gave to our attackers. Having watched a couple of Chelsea games and also the game between Dortmund and Bremen in the last few days, I came to realise once again how important it is for one of the two deeper laying midfielders to support the attacking midfielder as much as possible, in order to dominate the opposition in front of their box and add creative thrust (without losing positional discipline of course). Chelsea’s Mereiles really impressed me on Saturday against NU. Every time he came forward to support the attacking players, the Barcodes were put under severe pressure. In our game, I felt that Diaby and Arteta were not always effective enough in their support of our attackers/AM, but I would need to see the game again to see whether this was indeed so. Dare I say it; I thought we missed Song yesterday, although I also believe that both Arteta and Diaby will get better at supporting the sole AM as the season develops: they are both well-rounded, quality midfielders. However, I thought both Arteta and Diaby supported our defence really well when it mattered, and I was pleasantly surprised by Diaby’s physical/aerial presence; especially in the second half. I thought our defence played with discipline and focus and, on the few occasions they were called into action: they were a joy to watch. Unfortunately, the departures of brave sir robin and Song means we will have to go through another year of transition. But I have no doubt that Cazorla, Giroud and Podolski are quality additions to our team, and whilst they are gelling together with our other players, they will get better and better. The most important thing, though, is the back-to-basics approach with regards to our defence. We will not win anything anymore until we have a mean, lean, defensive machine again, and the first two games have been very encouraging with regards to establishing just that. With Liverpool away, Southampton at home, City away and Chelsea at home, between now and 29 September, our defensive will face tougher tests ahead, but like many others, I am getting more and more confident that Steve Bould has been making real progress in making us defensively sound, this summer. Add to that, that Giroud and Cazorla have come through the ‘Northern Test’ very successfully (and I expected nothing else from the Pod – the man is simply indestructible), and that Wenger keeps hinting there will be one or two more signings in the coming week, and there are plenty of reasons for us to be positive, despite the somewhat dull second half today. After all, only the Southern Oilers have been able to win all their games and, as unlikely as it may sound after two draws, we are above the Spuds and Pool, just two points behind the Northern Oilers, and only one point behind the Mancs and the Barcodes. It looks like Lady Luck is helping us to settle this new team in this time! Mannone and defence: 7.5 – all solid, disciplined and focussed – a real unit: 7.5. Arteta: 7.5 – quickly getting back to his very best. Diaby: 7 – better second half, despite tiring at the end. If he can stay fit for a while, he will become better and better. Fingers and all other body-parts crossed! Cazorla: 8 – real quality: our new dynamo and a natural strings-puller. MOTM. Gervinho: 5 – worked very hard, but this was not his best day. Podolski: 7.5 – loved his energy, physicality and thrust. Really happy to see he can play effectively for us on the left wing. Goals and assists are just a matter of time. Giroud: 7.5 – loved his energy, physicality, thrust and link-up play. Obviously, he is very eager to score goals and they will come. He just needs to settle in a bit. I must confess to liking Tony Pulis as a man, he is passionate, committed and honest (though deluded!) but I hate his tactics; I realise he has limited resources but that is no excuse to play the worst type of anti-football. Norwich, Swansea, Wigan etc show it is possible to stay in the PL on a limited budget without resorting to Route One physical football. Hopefully, the signing of Fatboy Huddlestone indicates a change of direction. 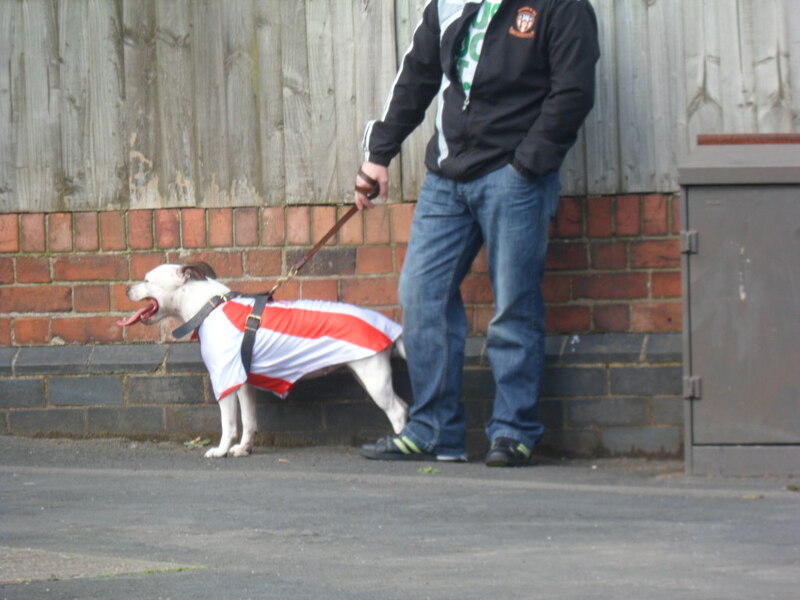 Some have expressed an opinion that we should be more accommodating and friendly towards Stoke and in a logical world I can empathise with this – but – addiction to Arsenal is totally illogical, as is the amount of time we spend discussing it! Fact: Football is tribal. Fact: One of my tribe was hurt by one of Stoke’s and there was no apology forthcoming. Fact: Stoke play a physical game designed to curtail the skills, pace, cohesion and equanimity of my warriors. Fact: Stoke fans hate us and Ramsey in particular. Fact: Rivalry in sport is what makes it so damned compulsive. So, I make no apology when calling Stoke “The Orcs,” nor when belittling their admittedly well run club. Yes, Stoke play with heart and commitment and generally within the rules of the game but “so what”. I don’t like them – not since we went down 5-0 in the first Double season (the pain was worse than MU last year). Bury the hatchet? Why? Why now? Should we reflect kindly upon our miscreant, cave-dwelling, knuckle-dragging neighbours? Of course not. No, the Stoke game has an emotional element which did not exist a few seasons ago when a trip to Stoke was just another hurdle on the way to the title; long may the rivalry continue. Right …. off the soapbox and onto the game. Stoke have a superb home record against the top clubs (losing only to Newcastle of the top 6 last season). We came away with an admirable draw despite wearing last season’s awful away kit. Today, we premier our lovely purple outfit – not sure it is proper Arsenal but at least our players no longer look as if they are in Cirque du Soleil (though I suspect Bob Wilson would not be impressed by Chesney’s pink ensemble). 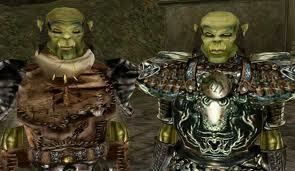 We know all about the excellence of Stoke’s twin Orcs at CB. I wonder if Pod and Giroud will have ever come across two such “committed” players. Thankfully, the little scrote Whitehead was sent off last week and will be absent. Mr Crouch has a penchant for goals against The Mighty Arsenal and our best bet has to be to stop his supply, but can Corporal Jenks or Young Gibbsy control a wily and pacy player like Etherington – we shall see. And please Mr Wenger put a player in front of Crouch at set plays with BFG marking him. Will we play O-C or continue with the fit Diaby? Gerv or Theo or both? Pod or OG? Gibbs or Santos? I really worry about our right side because Diaby has never shown himself to be strong defensively and Jenks will need cover. The connection between him and Theo needs much work. However, we will need Diaby’s height at set plays – an area where Sagna will be much missed. For this reason I would also play Giroud. Podolski may not be fully match fit but 70 mins pitch time will sharpen him plus playing The Orcs will give the new boys an important lesson in the leniency of EPL refereeing. Lee Mason has the whistle today. Rocky’s excellent post about the forced expansion of Stoke’s pitch and it’s effect upon the long throw tactic will be highlighted today. Will a referee ever add extra time for the “towel”? Expect to see the Orc fans doing the Wenger Wave which passes for humour in a town where there is very little to laugh about – let’s face it, if you were forced to live in Mordor wouldn’t you want to take the rise out of a multi-millionaire, successful, intelligent foreigner? Can we win? It will be difficult, as Stoke’s home record suggests. With the wind at our backs, a little luck, a secure defence and potency upfront – why not? 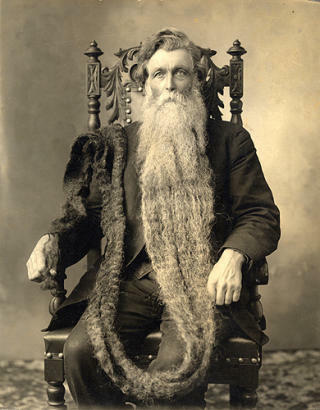 Some facial graffiti …… a world record beard measured at 18* 6″ (5.65m) owned by a Norwegian. Not another early season crisis ……..
……… Don’t worry! We survived it once and we can do it again, and this time, oh how we are in a better position! Think back to this god awful time last year. Bye-bye Fabregas and Nasri. Now think about the situation we are in now. Bye-bye Van Persie and Song. Ask yourself, which two players would you prefer to have? Don’t just go ‘Rvp scored 30 goals, Song set them up, obviously them’, because think about the last seven years of Rvp’s and Song’s careers at Arsenal. Song booed off at Fulham, Rvp continually injured! Cesc, a real servant to the club and I am happy about his success at his boyhood club, played on against Barcelona with a broken leg as he knew we had no subs left so would be one man down. Rvp would be crying about it! I would rather have Fabregas and Nasri in my team. One good season and a player we have nursed through his pathetic injuries shows his disloyalty. Nasri left, we were furious but he was only at us for three years, we hate him though. Song has left us now and I don’t think any fans know why he left us, I personally can not see him getting a lot of first team action at Barcelona. We can’t be too angry at him, good luck to him. Some fans believe that he isn’t good enough for Arsenal and should leave, well your wish has come true. Apparently his attitude was a disgrace, oh well. Cazorla played amazingly well against Sunderland, a mid table team. He should be able to play like this against top teams. Stoke may be a challenge as they are tall and tough. We didn’t get anyone like him last season, and he is a mix between Nasri and Fabregas, a quality player. We also have Podolski, a player who has started slowly. He was started upfront on his own, a place that he can play although his preferred and possibly best position, is too play behind the striker. Why he and Giroud weren’t played together I don’t know. Oh so Giroud missed that chance against Sunderland. His debut, first proper shot, on his right foot, not the easiest shot! The position Arsenal are in now, is potentially a strong one. We have lost one injury prone player who has had one good season in eight years, who has now gone to a team that will not be based around his qualities like we were last year. He will just be another player at Man United. We have lost a defensive midfielder who is not the best defender and attacker, but can occasionally provide some assists. Personally I believe that Song, isn’t the biggest loss. We have signed three players, one who really have shown his quality, Cazorla. He has been tipped as the signing of the season by Wenger, and if he plays with the same quality against Stoke in which he did against Sunderland, people may start to notice him and agree. We have been bombarded with different news regarding Sahin, it has taken more twists and turns than a horror, it isn’t ‘Who is the killer?’ but more like ‘Who will he sign for?!’. We brought him into the light with the proposed loan deal, but it wasn’t finalised because of the option to purchase him after the loan deal ended. Then news was announced that Liverpool hijacked the deal and he was going to be loaned to them, as Liverpool were more flexible on the option to buy him at the end of the season. Then we hijacked Liverpool’s deal to loan him, as Wenger phoned Sahin up directly and discussed the matter to him in Turkish, and the promise of Champions League football ultimately attracted him to join Arsenal instead of Liverpool. Sky Sports and BBC ‘understood’ that Sahin was due to have a medical today. A few hours ago sporting websites reported that Sahin’s deal with Arsenal had fallen through and he is now joining Liverpool, the same websites that reported that Sahin has passed his medical at us! Why is every single Arsenal transfer so painstakingly long? Until there is the headline on the Arsenal website reading ‘Nuri Sahin Join’s On Loan For 2012 / 2013 Season’, I am ignoring any reports on even Sky and BBC, unless they have a picture of him arriving at Arsenal (And not a fake one, there are already a few out there!). We have already been linked with Tiote to replace Song, with the money acquired from the purchase of Song. We were linked with him a few months ago, as well as Chelsea and Manchester United. I would link to see Tiote join us, as he can be a real midfield general, something Song wasn’t. Walcott has also been linked with a move away from Arsenal, and we have already been linked with dozens of replacements. Jesus Navas most notably and recently. I did a quick little internet search on Jesus Navas on Google. On the right is an extract from Wikipedia, showing a picture of him, his age, place of birth, and a small paragraph about him. It told me that he played for English Premier League Club Arsenal FC. I immediately went onto our website, nothing. Today Navas has claimed he knows nothing regarding him being linked to Arsenal. The major downside of being an Arsenal fan is that we can’t have a nice clean buy, for example Rodwell’s transfer to Manchester City. One story came out that Rodwell was being approached by City, a day and a bit later, conformation Rodwell had joined them subject to a medical. We were linked with Arteta before last years deadline day, but we made an approach for him on deadline day and even then we were told that we had dropped interest in him, then a few hours later made another offer. Another example is M’Villa. He has had about three medicals at Arsenal according to some website. But this all proves something. Wenger may have learned his lesson. He has already bought three players, all arguably world class, but he has said on the Arsenal website that the amount of players coming in depends on those that are going out. Well Cazorla joined after that, and then Song left as well, as we already knew Van Persie was going. M’Villa, Navas, Tiote? Yes please to them all. We are in a much better position compared to last year. We signed Arteta and Chamberlain, the only ones that worked really, Mertesaker Park didn’t really, and we have split opinions over Gervinho. The same with Santos. I liked Santos a lot, although not Gervinho as much. But this year maybe different, if we sign two out of those three players, we would have a really good team, with a lot of potential, although they would have to have a few games to all gel together. We have never had that really, and it is something I am looking forward too. Last transfer deadline day, I was worried that we wouldn’t sign Arteta and / or lose someone as important as Vermaelen or even Song! All I can say, is that I am really excited for this deadline day, as that is when Wenger seems to attack the market, as no clubs can steal the transfer, the club selling the player has too say yes or no, and quickly, so the Sahin transfer situation couldn’t happen (Well it wouldn’t take so many twists and turns). Under a week left too go before the end of this awful yet great, and possibly going to be an amazing, summer transfer window. What will happen before it closes I do not know, although if I was asked if I would like to know what will happen, I would say no, I love the drama of seeing all of the news headlines, and watching the sports news at ten o’clock, a few hours before the windows closes, and hearing about all of the possible transfers that have to be finalised for the window closes. You are currently browsing the blog archives for August, 2012.